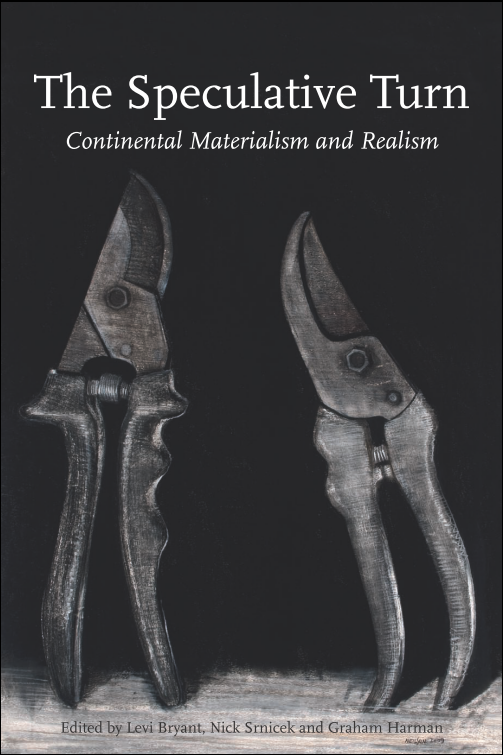 re.press has just released The Speculative Turn: Continental Materialism and Realism, edited by Levi Bryant, Nick Srnicek and Graham Harman. It’s a 430-page compendium of the speculative realism movement and its associates, downloadable as a free PDF and also available in paper format. There are many reasons to be excited about this volume, besides it being 430 pages and free. With all the buzz in the blogosphere about speculative realism and object-oriented ontology in recent years, newcomers to this emergent field had to rely on the wikipedia entries for an initial introduction. Chapter 1, “Towards a Speculative Philosophy” by Bryant, Srnicek and Harman does now provide a more thorough yet still very accessible introduction to this movement’s origins and main concerns. The egalitarianism of the book is also admirable, as it contain contributions from academics at various stages in their academic career, from PhD students to academic celebrities. 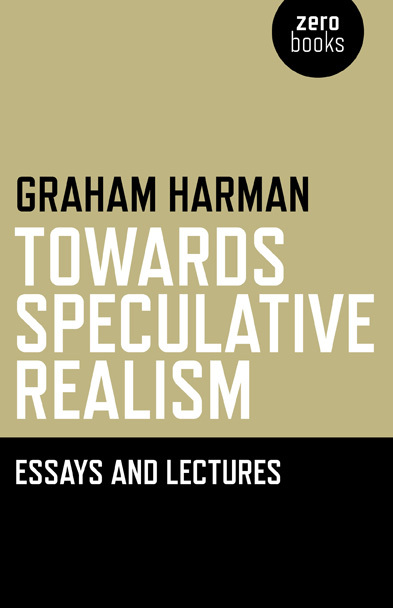 There are pieces here by all the original founders of speculative realism (Ray Brassier, Iain Hamilton Grant, Graham Harman, and Quentin Meillassoux), as well as some of the philosophers who inspired them (Alain Badiou, Manuel DeLanda, François Laruelle, Isabelle Stengers, Slavoj Žižek). Naturally much of the book revolves around the debates between the main proponents of the movement – as well as with some of their attentive readers – which should contribute to a further crystallisation of the various competing positions. There are however also some interesting contributions by those aforementioned forerunners, for example Latour on modes of existence, DeLanda on emergence, Žižek on Hegel, and Stengers on materialism. Indeed, the excellent introduction provides a very helpful overview of the included essays. Finally, let me just add that I love the cover image of the book, the debating bypass secateurs (at least I think they are debating), which seems very appropriate for this compendium. 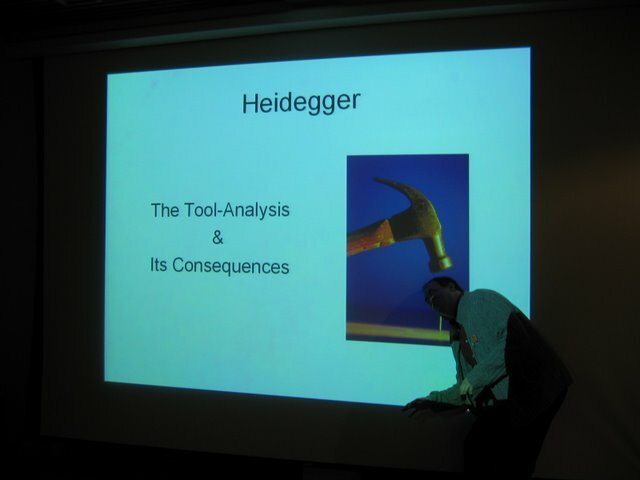 First of all, there is the reference to tools, which are so central to Harman’s Heideggerian argument (‘tool-being’ and all). These secateurs are broken tools in a sense, because they are made to be present-at-hand, by the very fact that they are presented on a book cover, in dramatic, anthropomorphic poses, as if they were engaging in a dispute. Then there is also the association to what these secateurs usually do, what they are used for: essentially cultivating and then harvesting things. And they do this through pruning, by shaping trees and bushes, and here, arguments. P.S. As the re:press site is down right now, here is an alternative download site. News of the Speculative Turn anthology have hit the blog waves. There is now a holding page for the forthcoming book on the re.press site, and Levi Bryant provides the genealogy. Graham Harman delivered a brilliantly dense paper in Zagreb over the weekend. He defined and redefined realism and materialism only to abandon both (in favour of the term “realism without materialism”), in pursuit of an object-oriented philosophy that fuses the most interesting insights of Heidegger and Latour. Download the audio file [100MB MP3] of the lecture and the discussion that followed [1 hr 49 min] from the website of the 21st Century Materialism Workshop. In addition to the recording and the PowerPoint slides of the ANTHEM session where it served as the basis for the discussion, a copy of Graham Harman’s paper “The Assemblage Theory of Society” on Manuel DeLanda is now also available online [PDF], courtesy of Nick at Speculative Heresy. This paper was first presented at the Deleuze2008 Conference in Stavanger, Norway. Check out the Resources page of Speculative Heresy for some other goodies. It appears that in recent days the audio file of Graham Harman’s talk on Manuel DeLanda has become corrupted on eSnips, the free data storage service we use for hosting the ANTHEM recordings. We are not sure if it happened because of the volume of downloads (over 160 in a few days) or because of a change in service quality at eSnips, which has been recently acquired by another firm. In any case, after a number of failed attempts we have managed to upload a fresh copy of the file, which seems to work fine for now. Here is the link to the audio recording once more. Apologies for these technical problems, and also for the overbearing advertising on eSnips. Up until now we were fairly happy with this service but we may have to look for an alternative solution if these problems keep recurring. Any suggestions for other free file hosting services would be most welcome. 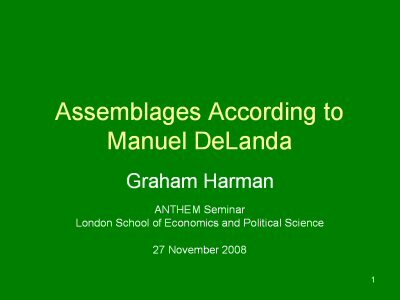 A recording of Graham Harman’s ANTHEM seminar talk at the LSE yesterday, entitled “Assemblages According to Manuel DeLanda,” and the discussion that followed, is available here (1 hr 47 min). A PDF file of the PowerPoint slides can be downloaded from here. 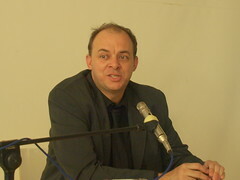 Harman evaluated the ontological assumptions behind DeLanda’s realism, his notion of assemblage and his theory of causation, by tracing their origins in Deleuze and Bhaskar, among others. He then contrasted DeLanda’s ontology with that of Bruno Latour and concluded by presenting his own object-orientated approach to thinking about causation, objects, and emergence. As announced earlier, we are expecting Graham Harman to join us at Thursday’s ANTHEM seminar. Dr Harman has also very kindly agreed to give us a talk, accompanied by a PowerPoint presentation, in order to summarise but also expand on the main points of the paper (“The Assemblage Theory of Society”) that he has shared with us. The title of his talk is “Assemblages According to Manuel DeLanda.” The main themes are realism, causation, emergence, assemblages, essence, DeLanda, Deleuze, Bhaskar, Latour, and Harman’s own (Heideggerian) object-orientated philosophy. You are currently browsing the archives for the Manuel DeLanda category.